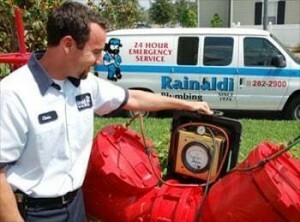 Based in Orlando, Florida, Rainaldi Home Services got its start in 1974. From the beginning we knew that the quality and speed of our service were equally important- and our Same-Day Service Guarantee was born. As one of the first plumbing companies in Central Florida at the time, we soon became a fixture in community and gained the experience needed to take on ANY job- however large or small. 40 years later and we can now say the same thing about your Air Conditioning. In fact, we have built our entire company around our ability to do it all the same day you call. We don’t plan on changing that. Looking back, we can hardly believe 40 years and two generations have passed. We have learned and grown so much, but our philosophy remains the same. We treat our customers how we want to be treated. We hope you will give us a call. Rainaldi is committed to 100% customer satisfaction and our team is trained to the highest standards. We believe in excellence in all areas and make it our job to earn your trust. We love hearing from you and hope you’ll use one of the variety of ways we offer to stay in touch. Whether it’s to schedule service, interest in an estimate on a new product, or just a question, we’re happy to help you out!